This was probably one of the more difficult recipes for me to develop, but not because I couldn’t figure out the flavors and consistency, but because I couldn’t get myself to STOP eating the hot roasted cauliflower coming out of the oven every time I tried to make this soup! Cauliflower is one of those vegetables I use frequently in my cooking, such as here, because it provides a nice texture, but it was never a veggie I truly enjoyed. However, with this dish, I discovered a whole new element of cauliflower, oven-roasted, which is absolutely amazing. 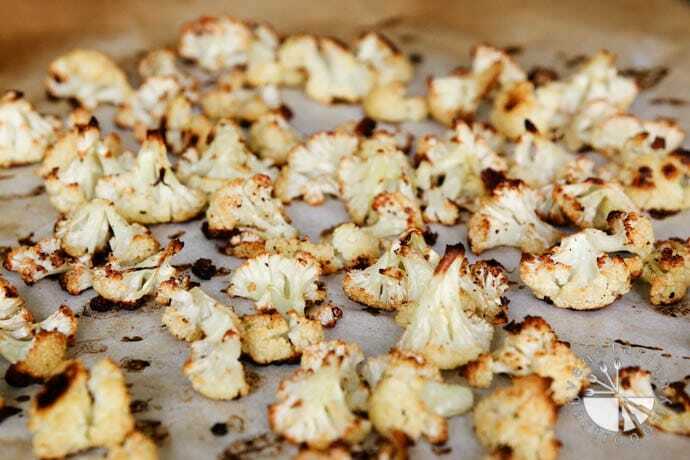 As I mentioned, when I first developed this recipe I couldn’t stop eating the roasted cauliflower hot straight out of the oven. Before I realized it, I had finished over half, straight from the baking sheet! 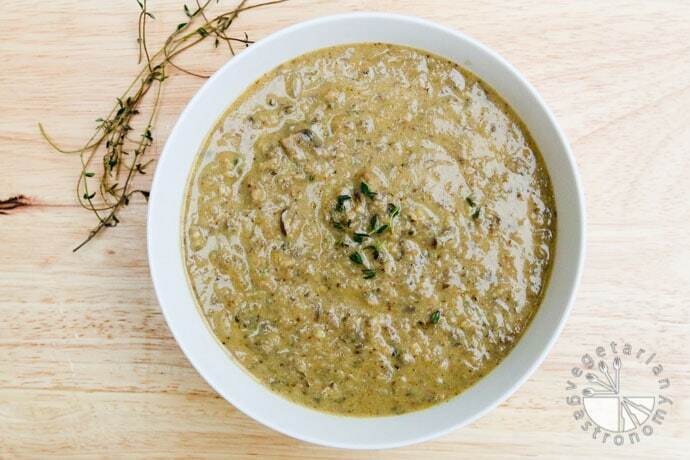 I eventually finished this delicious recipe for Roasted Cauliflower & Mushroom Soup! 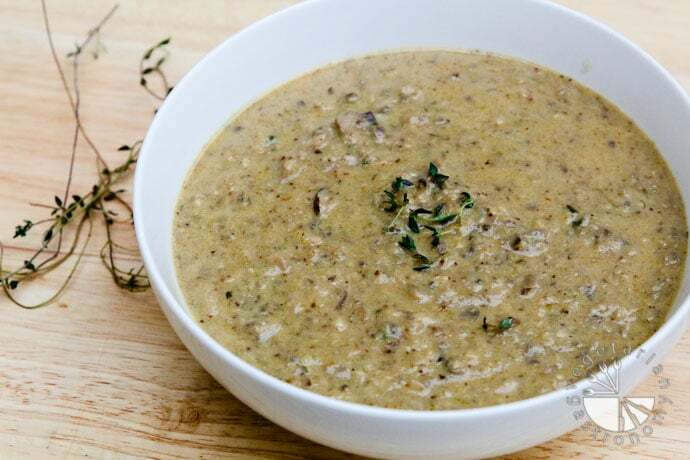 Although I ended up going in a completely different direction when developing this recipe in terms of ingredients and cooking method, the initial inspiration for combining both mushroom & cauliflower into a creamy soup came from Kalyn’s Kitchen‘s Mushroom & Cauliflower Pressure Cooker Soup. Overall, this soup is very easy to make and full of flavor. My favorite part about this soup is the ‘chunky’ texture. Instead of completely pureeing this soup, I pulsed it a few times to keep some of the veggies intact so that it’s not only nice and thick, but you can also taste the roasted cauliflower and mushroom pieces in the soup. I served this soup for dinner with a side of toasted french bread, and even my kids loved it. I was fortunate to have some leftovers for lunch the next day. In fact, after the soup had some time to sit, even more of the flavors were brought out. 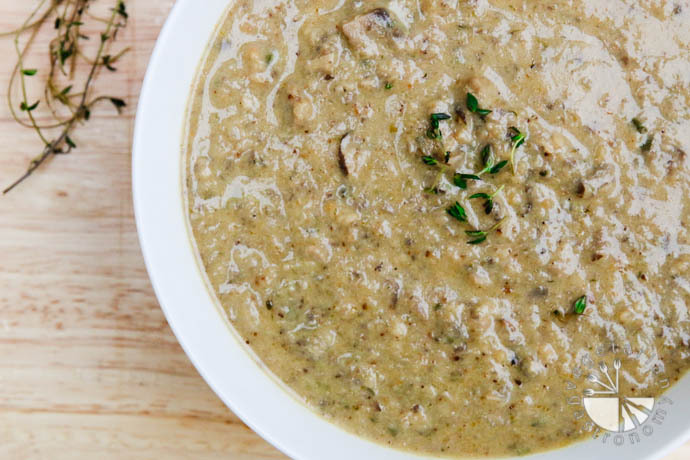 The flavor of the mushrooms also really comes through in this soup, so if you’re a mushroom lover, this recipe is definitely for you! You can probably guess what I will be experimenting more with in this next month… yep, something involving oven-roasted cauliflower! I’m also excited for the next few weeks because I have some exciting giveaways planned for all of you! 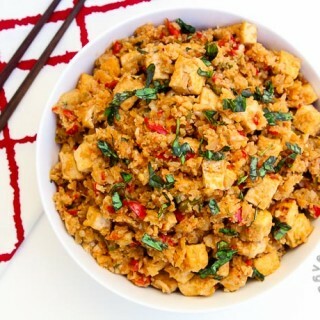 UPDATE: I recently modified this recipe to Veganize it, and it turned out delicious! I’ve added the modifications below for a vegan-option. Flavors of roasted cauliflower, mushroom, thyme, and garlic come together to create this rich and delicious hearty family-friendly soup! 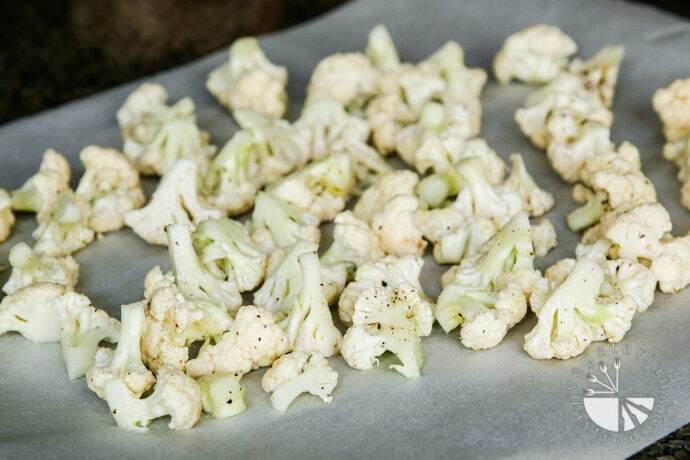 Toss the cauliflower florets with 2 tbsp olive oil, salt and pepper. Roast in the oven for 20-30 minutes until the florets are golden brown. In the meantime, continue on to the following steps. In a large non-stick pot, heat 1 tbsp oil on medium heat. Add the garlic and fry for a few seconds until fragrant. 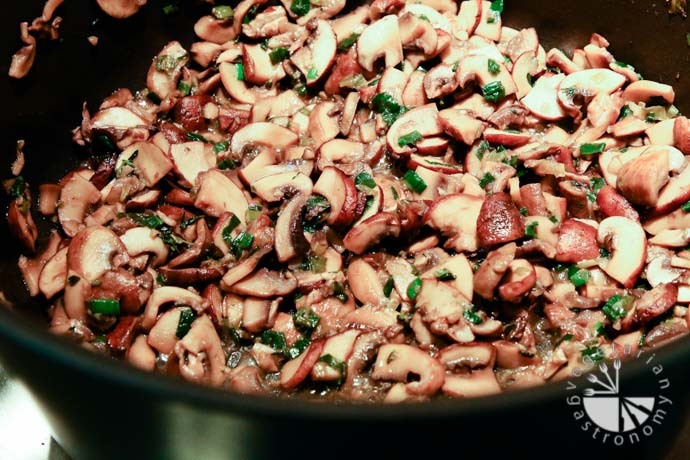 Immediately add the mushrooms and thyme and saute on medium heat until the water released from the mushrooms is mostly evaporated and the mushrooms themselves are tender. Add the green onions and cook for an additional 5 minutes, mixing frequently. Add the white wine and cook until the liquid reduces to about half the volume, mixing frequently. Add the roasted cauliflower and vegetable broth and bring to a boil. Once boiling, reduce the heat and simmer for about 30 minutes, covered. 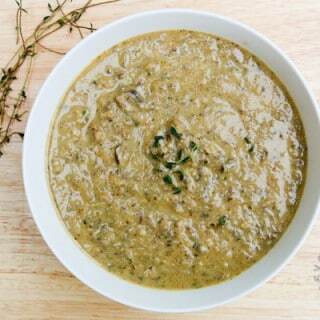 Using a stick immersion hand blender , puree soup in brief pulses until you reach the desired thickness and chunkiness. Note that some of the mushrooms and cauliflower in the soup should be in pieces so that the soup is "chunky" in nature and not completely smooth. If using, add the non-diary milk and vegan parmasan cheese and simmer on medium heat for about an additional 10 minutes. Serve the soup hot with a side of your favorite bread. Vegetable Broth - I use Imagine Brand Low-Sodium Organic Vegetable Broth in most of my recipes and soups. Non-Dairy Milk - If you prefer a creamy soup, use a neutral flavor unsweetened non-dairy milk such as cashew milk or almond milk. You can also opt to omit the non-dairy milk completely and the soup will still taste great, just thicker (I've tried both variations). Vegan Parmesan - I prefer using Follow Your Heart brand or Violife brand. Thank you so much and so glad you loved this soup! It's also one of my favorites. When I went vegan a few months ago, I was worried this soup wouldn't taste as great without the dairy and that I would have to work out some substitute, but to my surprise, it was just as delicious by simply omitting the milk and cheese! I love the flavor of the roasted cauliflower and mushrooms even more when I made this vegan...although I will have to try adding a splash of coconut milk next time. Thank you so much! 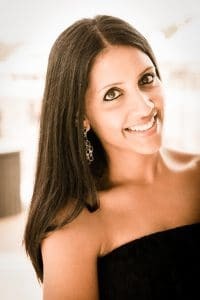 And hoping to veganize some of my older recipes as I re-make them. Thank you for the comment and for following! Wonderful and as another reviewer stated, unique taste. For me, this will be a new a comfort food! I love roasted cauliflower so this is a happy addition. 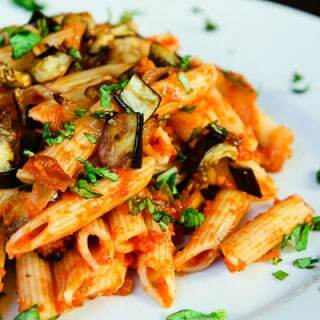 I used crimini mushrooms which were very flavorful. To my taste, almond milk was a distraction. I tried it with and without almond milk and preferred it with either real milk (am not a vegan) or no milk/cream at all. Also had no cheese in the house; tasted very good though I think cheese would enhance it. A great Receipe! Thank you. Thank you so much for trying it out and the comments! I actually first developed this recipe before going vegan, hence the regular milk and cheese. After going vegan I had it both with and without almond milk and omitting the cheese and I agree with you, without the milk completely is the better option and that's usually how I have it! You reminded me that I need to revisit this recipe...i think if i was to make it now, if I wanted that creamy flavor, I'd add a little cashew cream =) Thanks again for trying it out!! Thanks for this recipe. Genius to roast the cauli first. Takes the cauliflowery edge off it. I added a half tsp of turmeric and some curry leaf powder into the mushies and sprinkled in some porcini powder to pack the flavour in. And am not a vegan so cream and cheddar cheese to finish off. No bread required! Great! Glad you loved it!